The biggest ship ever to enter the Port of Liverpool is due to arrive in Merseyside's docks later. 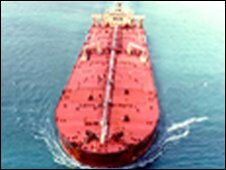 The Bauhinia, which weighs 158,000 gross tonnes, will berth in Tranmere Oil Terminal at 1500 GMT, carrying a cargo of crude oil from West Africa. The vessel is 8,000 tonnes heavier than previous record holder, the Nisa, which berthed into the River Mersey in 1988. The ship is not carrying a full load of cargo because it would make its draught too deep to sail into the River Mersey. It was built in South Korea two years ago and is 332m (363 yards) long and 58m (63 yards) wide. The 82,000 tonnes of oil being carried by the Bauhinia is the first cargo from Angola to be offloaded at Shell's old terminal in Wirral and piped to Stanlow oil refinery in Ellesmere Port. Yuri Sebregts, Stanlow's general manager, said: "The arrival of this vessel on Merseyside will be a very positive development. "We are now in a position to import crude oil from West Africa which further improves our capability as a reliable and competitive supplier of fuel products to our customers in the north west UK."